“Hoppy Birthday” card. Papers from the Whitebean collection. The rick rack is from our Pink/Green Bean Stalk. “Hoppy Birthday” was printed using my computer. 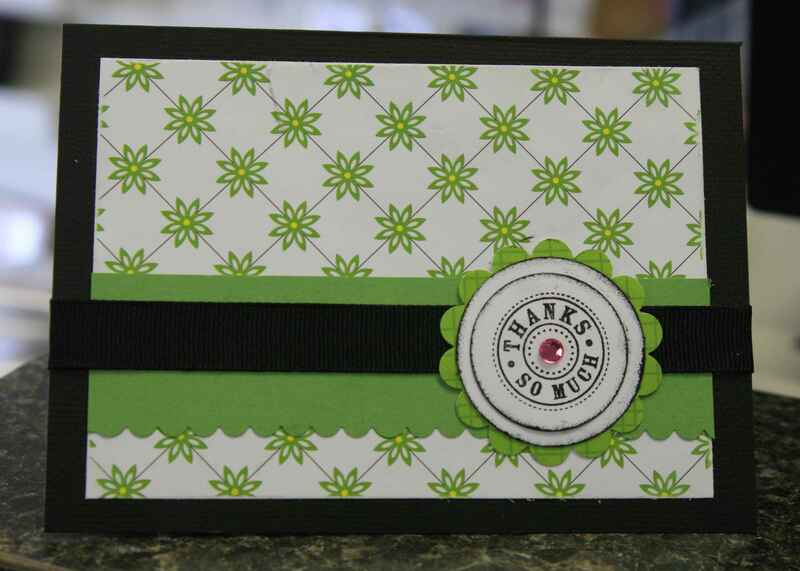 “Thanks so Much” card. Again, papers are from the Whitebean collection. The ribbon is from the Red/Black Bean Stalk. A Stampin’ Up punch was used for the scallop. Fiskars scalloped edge scissors were used for the scalloped edge on the green. The “Thanks So Much” stamp is from Hero Arts. “Hi” card…this card was also in our booth at CHA. I recently used it for a card class at Scrapbook Art. It’s so simple but cute. All papers are from the Minestrone collection. The rick rack is from the Red/Black Bean Stalk. “Hi” was printed using my computer. All circles were cut using Creative Memories tools. “Hello” card. Again, papers are from the Minestrone collection. Twine is from the Green/Brown Bean Stalk. 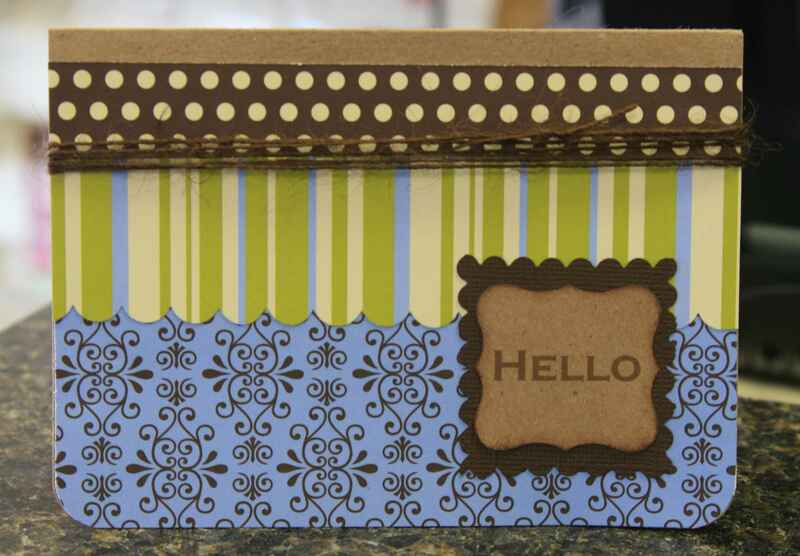 “Hello” was printed using my computer and punched with a Stampin’ Up punch. The square background is cut using Fiskars scalloped edge scissors. These are fabulous, love them! These are all so darling! I love that last one! Those frogs are so stinkin’ cute…thanks for sharing! Cute cards. I especially love that one with all the circles!! Oh I love the variety of cards! I love the idea of a grouping of circles, I shall have to try that out today, great way to use up scraps. I love the frog card-very cute! Love the circles too-great idea! Frig. I love the froggy card. Sadly that paper is already sold out at our store. *sigh* Time for a re-order, I’d say! Such cute cards! The pp is just fabulous…love the colors and patterns! These are all so cool! I esp. 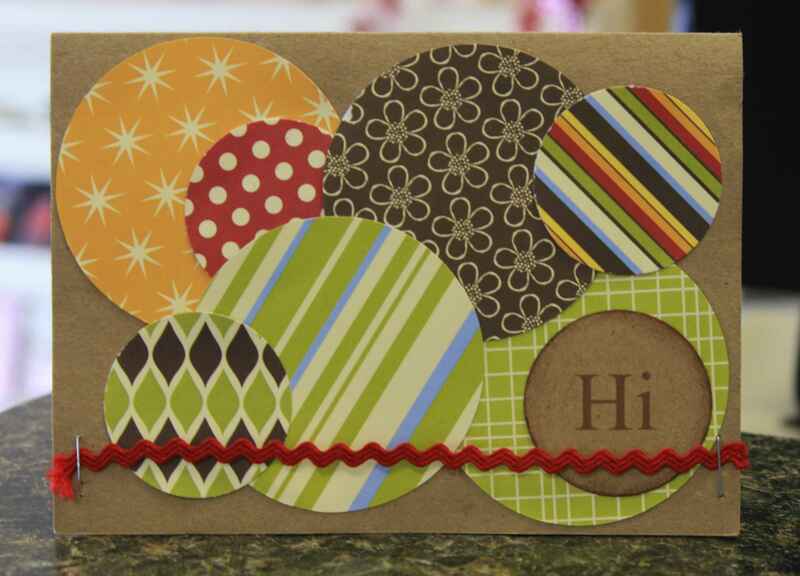 like the one w/ all the circles – looks great w/ the yummy papers! I’m lovin’ all the rick rack and jute/twine! Oooh, these are all SO cute but I must say I have two favs. 🙂 I love the froggy card and the circle card. Just adorable! Cute, cute, cute! Oh they are all too cute! 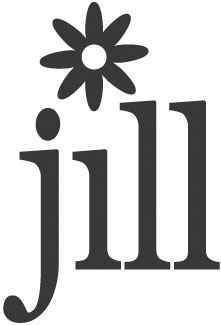 I REALLY need to get my hands on some jillibean!!!! 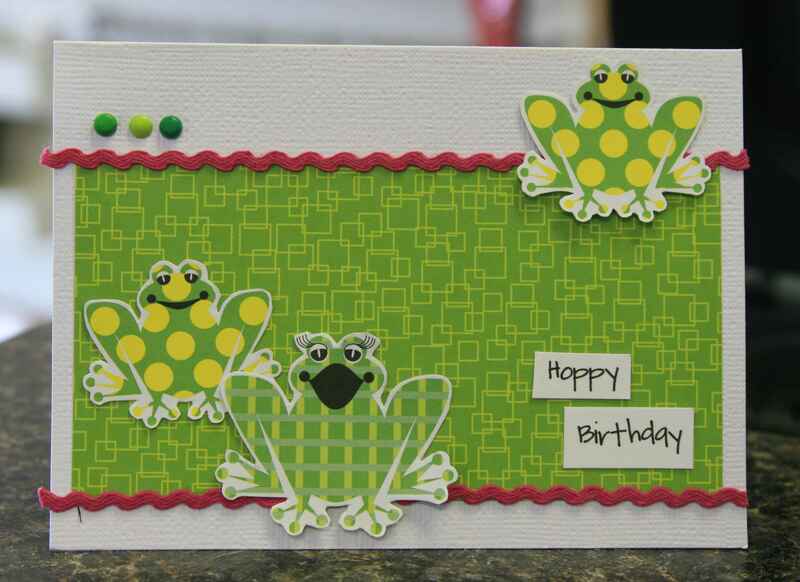 love your cards & the frogs, seriously cuuuuuute! Your cards are gorgeous, Jill. I love the one with the circles. The one with the frogs is cute. If all goes as planned the JB Soup papers and embellishments will arrive at my favorite Dutch store by the end of the week. Can’t wait to get my hands on it, because I have used all my Minestrone papers from the CHA sampler pack and I can’t do without them. I soooo love your papers. these are great cards, makes me want spring-time to be here even quicker. thanks for the hint of spring and continued inspiration! I love the cards. The colors are so great and they are all so different. They reach such a variety of people. I have to get me that SU scallop punch! I don’t know any SU reps!!!! I especially liked that card. The frogs were too cute and I like the use of the white paper with printed words from the pc! Thanks for sharing these designs with us! those frogs r 2 cute. Love the all the bright colors!!! The ones with the Minestrone papers are my favorites!! Love the cards Jill!! I remember the circle card…one of my faves from convention! I especially love the circles and the frogs. Just loving all these cards, they are really cute and colorful…. Super cute cards, love them all!!! These cards are just too cute. I love your cards so much. I wish I had the “gift” like you! !